We love our pets, and it’s been a joy being with them through the years. They are there for you and you’re noticing that perhaps now, perhaps they need a bit of help from you. As pets get older it’s hard for them to tell you what their changing needs are. 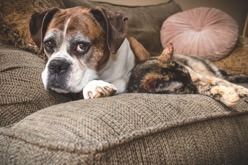 I always like to point out that old age is not a disease; pets slow down not just from “getting older,” but because they’re dealing with arthritic joints or underlying diseases that lead to muscle wastage and weakness. These are things that can be managed, or even treated, to ensure pets aren’t suffering in silence. What was once the easiest of jumps onto their favourite sleeping spot could now be a daily chore. A ramp or small steps around the house is a good idea to get onto the bed or outside to the toilet. Even just moving their bedding, litter trays, or food and water bowls to more accessible areas in the house could be the solution. Many owners find that their pets are going to the toilet in inappropriate places. Doing a bit of investigative work could let you know that your old cat isn’t naughty, but struggling to get into the litter tray because of creaky old joints. Or your furry senior needs to go more frequently due to underlying medical issues (mainly kidney disease or hormonal disease like hyperthyroidism or diabetes), and hence wants the tray to be cleaned more frequently, or have multiple litter trays. Dogs may need to be let out more frequently. If these issues arise, your vet may recommend a urine and/or blood test to check if these problems can be fixed. ur bodies get a bit of wear and tear and need a bit of extra TLC as we age, so do our beloved pets. It can be so rewarding to see them living full and pain free lives.